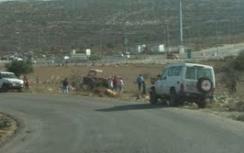 IDF halts attempted Arab "land grab" near Tapuach Junction in Samaria. Red Cross jeeps accompanied the Arabs, and plans to return tomorrow. The International Committee of the Red Cross (ICRC), attempting to help Arabs in Samaria take over a plot of land bordering the Tapuach Junction checkpoint, says it will return tomorrow to complete the project. Early Sunday morning, IDF soldiers at the Tapuach checkpoint were surprised to see an empty field suddenly come to life. Some 50 local Arabs, accompanied by three Red Cross jeeps, arrived on the scene for an attempted “land grab.” Eyewitnesses said they saw Arabs emerging from the jeeps. Over the past decade, a local Jewish shepherd has grazed his goats on the large plot of land, which borders the southwest part of the large junction and which has not been cultivated in many years, if ever. Despite this, the Arabs, with mules and small tractors, spread out over the area and began clearing it. The checkpoint junction is traversed by hundreds of Jewish cars each day; for the land in question to become “Arab” would be a major change of the status quo. After a short while, the IDF soldiers on the scene ordered the Arabs to stop working and to leave the area until they provide documentation that the land is theirs. Israel National News contacted the International Committee of the Red Cross (ICRC) to ask why its jeeps were there and in what capacity they were accompanying the Arabs. The spokesperson originally surmised that its vehicles could not have been there, but upon being shown the photographic evidence, she promised to investigate, and in fact later returned with a response. The spokesperson explained that the ICRC is in fact helping the Arabs in question "rehabilitate" the plot of land near Tapuach, and that though actions of this type are always taken with the IDF's consent, this time there was a "mis-coordination." She promised that the ICRC would return tomorrow (Monday) to the site to complete the "reclamation" of the land. The spokesperson further said that the ICRC's mandate is not only to help victims of armed conflict, but also to provide "protection, assistance and economical security" for a "small period of time" to those who are in "dire need." Asked if Jews could also apply to the ICRC for such assistance in the case that they are actively thrown off their land, she acknowledged that this was unlikely, as "our mandate is basically for those under occupation... Israel is a democracy with organizations and bodies to which citizens could apply for help." She brushed off suggestions that Arabs in need could apply to the Palestinian Authority for help.